The shape of the traditional cooking pan is one that has remained unchanged for decades — centuries, even — but now, thanks to U.K. rocket scientist Dr. Tom Povey, pots and pans have finally gotten a modern update. Povey, a professor and researcher at Oxford Univerity’s Osney Thermo-Fluids Laboratory, has developed a unique cookware line that draws inspiration from jet engines. Using a set of special fins, these radical-looking cast-aluminum pots and pans are able to carry heat to the base and sides of the vessel far more efficiently than conventional pots and pans, reportedly cooking food up to 44 percent faster. In other words, the Flare line takes less time, less energy, and ultimately less money to cook your meals. Povey hatched the idea for the pans while on a mountaineering trip, where, up at higher altitudes, it takes much longer to boil a pot of water than it does at sea level. Frustrated that he was burning so much of the precious fuel he’d just hauled up the mountain, and realizing that most of it was going to waste, he set out to design a more efficient pot. The Flare line started selling exclusively through U.K. kitchenware brand Lakeland last week, but this cookware won’t come cheap. 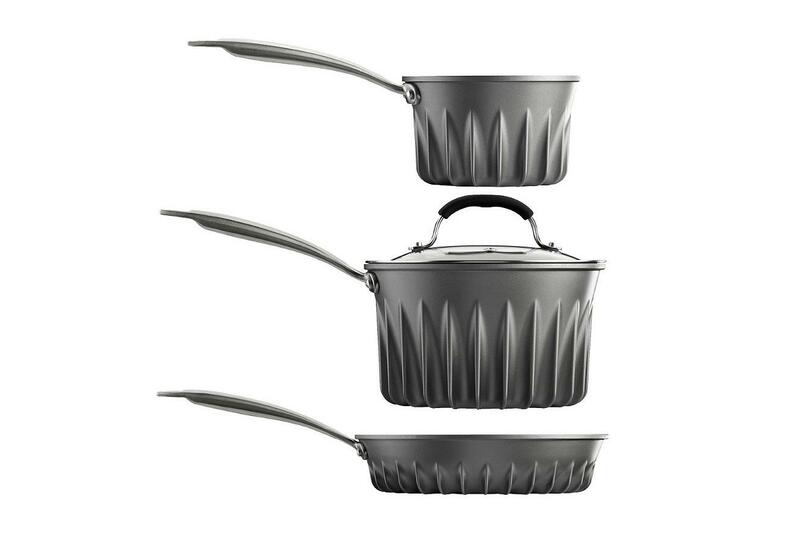 If you want to get your hands on one of these badboys, be prepared to spend anywhere from $85 to $144 for a single pan. That’s a bit steep for cookware, but since these pots and pans are nearly 50 percent more energy efficient than the gear you already own, it could very well save you money in the long run!